It may be uncomfortable to contemplate, but some parents may find themselves in need of the type of care they once provided to their own children. 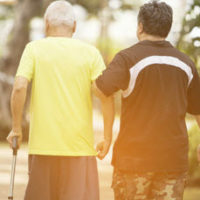 While this role reversal may be uncomfortable, it does offer the benefit of being able to stay in one’s home, as well as avoiding the cost of assisted living or nursing homes, and having one caretaker exclusively devoted to addressing the person’s needs. When adult children take over this responsibility, it often requires them to make sacrifices professionally and personally. Parents may want to acknowledge such efforts by giving them a greater share of their assets compared to other children and family members. One option parents in this position might choose is to transfer ownership of their home to the adult child caregiver. This act acknowledges what the adult child had to give up before stepping in as a caretaker, and provides the parent an important exemption from the disqualifying transfer penalties that could prevent eligibility to receive Medicaid assistance. At-home care by an adult child is frequently a precursor to needing care in a nursing home when the medical issues become too complicated for the child to handle alone, and Medicaid is the primary source the majority use to cover the high costs. A discussion of the exception to asset limitations for Medicaid qualification as a result of transfers to child caregivers will follow below. provided care that permitted the parent to remain at home for a longer period before outside care was necessary. This transfer exception only applies to biological and adopted children; other relatives are excluded. a Personal Services Agreement between the parent and child outlining the services the child will provide, to include activities such as: medication management, meal preparation, dressing, bathing, toileting and assistance with other activities of daily living, handling the payment of bills, shopping, maintenance of property, and otherwise protecting the parent’s health and safety. Evidence that the child actually resided in the home will also be required. Copies of bills, tax returns and a driver’s license should be sufficient to prove if and for how long the child lived with the parent. Paying for a nursing home is no small thing, so any asset transfer that could impact Medicaid eligibility should be reviewed by an elder law attorney to avoid unintended consequences. Planning for nursing home care takes time and thoughtful consideration to protect your assets to the fullest extent possible. Working with an elder law attorney that has experience with nursing home planning can make a significant difference in how well-protected your legacy and the financial well being of your family can be. William Rambaum has decades of experience helping clients plan for nursing homes and Medicaid eligibility, and can help you address any related questions and concerns. Contact the Oldsmar office to schedule an appointment.